Each film-coated tablet contains-Vitamin A 5000 IU,Vitamin C 60 mg, Vitamin D 400 IU,Vitamin E 45 IU, Vitamin K 10 mcg,Thiamine 1.5 mg, Riboflavin 1.7 mg,Niacin 20 mg,Pyridoxine Hydrochloride 3 mg,Folic acid 400 mcg,Cyanocobalamin 25 mcg,Biotin 30 mcg,Pantothenic Acid 10 mg, Calcium 200 mg, Phosphorous 48 mg,Iodine 150 mcg, Magnesium 100 mg,Zinc 15 mg, Selenium 20 mcg,Copper (as Copper Lysinate) 2 mg, Manganese(as Manganese Glycinate)2mg, Chromium 150 mcg, Molybdenum 75 mcg, Chloride 72 mg, Potassium 80mg, Boron 150mcg, Nickel 5mcg, Silicon 2mg, Vanadium 10mcg,Lutein 250 mcg. Proviten Silver is a comprehensive well-balanced multivitamin and multimineral preparation scientifically adjusted and designed to serve as the complete nutritional program for the elderly people. This preparation maintains a healthy body and active lifestyle and keeps proper nutrition covered for elderly people. 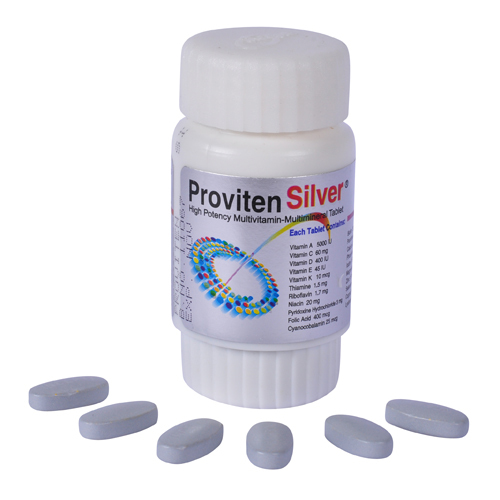 Proviten Silver is indicated for the prevention and treatment of vitamin & mineral deficiencies of the elderly people. As a complete daily nutritional supplement, Proviten Silver is also indicated to meet the increased demands for vitamins and minerals in the conditions like- physical & emotional stress, chronic diseases, Alzheimer\\\'s disease, age-related vision disorders, infection illness, osteoporosis, injuries or wounds, surgery, poor digestion, poor appetite, exposure to air/water pollution, exposure to radiation, etc. One tablet daily or as recommended by the physician. Generally well tolerated. Precautions: Folic acid in doses above 0.1 mg daily may obscure pernicious anemia in that hematological remission can occur while neurological manifestations remain progressive. Consultation with the physician is recommended before use of Proviten Silver in pregnancy and lactation.